SKU: 030745195X. Category: Food & Cookbooks. With 200,000+ copies in print, this New York Times bestseller shares the story and the recipes behind the chef and cuisine that have changed the modern-day culinary landscape. 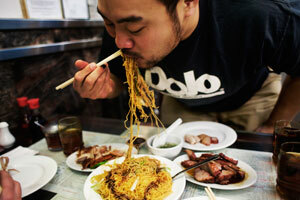 Never before has there been a phenomenon like Momofuku. A once-unrecognizable word, it’s now synonymous with the award-winning restaurants of the same name in New York City (Momofuku Noodle Bar, Ssäm Bar, Ko, Má Pêche, Fuku, Nishi, and Milk Bar), Toronto, and Sydney. Chef David Chang single-handedly revolutionized cooking in America and beyond with his use of bold Asian flavors and impeccable ingredients, his mastery of the humble ramen noodle, and his thorough devotion to pork. Chang relays with candor the tale of his unwitting rise to superstardom, which, though wracked with mishaps, happened at light speed. And the dishes shared in this book are coveted by all who’ve dined—or yearned to—at any Momofuku location (yes, the pork buns are here). This is a must-read for anyone who truly enjoys food. Our ginger scallion noodles are an homage to/out-and-out rip-off of one of the greatest dishes in New York City: the $4.95 plate of ginger scallion noodles at Great New York Noodletown down on the Bowery in Chinatown. Ginger scallion sauce is one of the greatest sauces or condiments ever. Ever. It’s definitely a mother sauce at Momofuku, something that we use over and over and over again. If you have ginger scallion sauce in the fridge, you will never go hungry: stir 6 tablespoons into a bowl of hot noodles–lo mein, rice noodles, Shanghai thick noodles–and you’re in business. Or serve over a bowl of rice topped with a fried egg. Or with grilled meat or any kind of seafood. Or almost anything.